On January 22, Evo Morales celebrated his first year as Bolivia’s president. No one can deny that in this time, despite the problems he has had to confront, there has been a clear improvement in the majority of principal economic indicators, possible thanks to the fact that one of the first measures of his government was ending the relationship with the International Monetary Fund. By allowing the agreement with the IMF to expire it has given the government of Morales a certain liberty to push forward with new economic and development policies. One of the first measures put in march by the government of Evo Morales was to increase its control over hydrocarbons. The high prices on the international market and the increase in taxes for petroleum companies demonstrated to Bolivians that the changes could reach their pockets in beneficial way, along with the social plans that have reached even the most distant and abandoned places: literacy programs, soft credit loans for the purchasing of tractors by agricultural cooperatives, extension of healthcare thanks to the 2000 Cuban doctors and other improvements. With a starts, and criticism for what has been considered a timid policy at the time of putting into practice the nationalisation of hydrocarbons, what is certain is that it has allowed the country to have a growth rate –talking always in macroeconomic terms – of 4.1% this year, a percentage not seen in Bolivia during the 20 years that the country was subject to the dictates of the IMF and World Bank. The government of Morales has maintained a more pragmatic behaviour and has not given the state company, Yacimientos Petroliferos Fiscales de Bolivia (YPFB), the predominant role that, for example, Venezuela’s PDVSA has been playing, to push forward a drastic change in the improvement of the living conditions of the great majority of the population. A lost opportunity, where one has to point out the important role that Lula’s Brazil has played in “moderating” the application of the nationalisation. Regardless of this, it is not just a few voices who are asking for a “refoundation” of YPFB so that production and exploitation of hydrocarbons is really in the hands of this state institution. The moderate nationalisation of hydrocarbons did not expressly disturb the oligarchy (according to the polls 90% of the Bolivian population supported the nationalisation), but what did was the passing of the new agrarian reform law which if applied to the full extent would suppose the redistribution to campesinos of some 123,000 kilometres squared of idle and unproductive land, a size equivalent to two countries, Austria and Switzerland put together. For now, only 11% of the idle land in the hands of large landowners has been handed over to campesinos. It is not a frontal attack on the large landowners, nor less so, but it is a measure that the oligarchy considered a vital threat to its status quo, given it is where their power is situated: the actual Episcopal Conference of Bolivia considers that 90% of productive land in Bolivia is in the hands of 50,000 people. Since then the attempts to overthrow the Morales government have been continuous, only changing in form, amongst which the latest is the demand of “autonomy” from a series of departments: Beni, Pando, Santa Cruz and Tarija. The oligarchy’s proposal for regional autonomy only won in these departments, and was abruptly defeated in the rest of the country, but the US ambassador in this Andean country, Phillip Goldberg, is playing a crucial role in the plans for what is now occurring. This man has occupied important positions in the US diplomatic missions in ex-Yugoslavia and in Kosovo, which is why his naming was not coincidental, given it occurred only months after the failure in the referendum on autonomy pushed by the oligarchy. In Bolivia the trajectory of this ambassador has been followed in great detail and they speak openly of the dangers of the “balkanisation” of the east of the country . Since that moment, the objective has been to overthrow Morales. The so-called opposition and the economic elite consider that the reforms put in march are a threat to their way of life and they are using all the means possible to impede them being consolidated. It is also a racist struggle: “if us cambas [white, majority inhabitants of these departments] don’t unite, the collas [indigenous peoples] will want to ruin us, given that unfortunately we have an indigenous president” . It could be said louder, but not clearer than this. Following the partial failure at that moment to impede the passing of the agrarian reform law – and although it is moving forward very slowly – the oligarchy has opted to agitate around the banners of autonomy for what in Bolivia is know as the “half moon”, the most eastern departments which hold the largest reserves of gas in the country and where the most fertile lands exist. During the months of November and December, the oligarchy launched various ultimatums warning the government that if it did not attend to its demands it would declare “de facto” autonomy, to which Morales responded with a call to the armed forces to defend national unity. 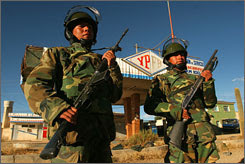 Although the separatist pretensions are not likely to succeed in the immediate future, it is worth looking at the role that the government of Evo Morales has given to the army and recall what the president of Venezuela, Hugo Chavez, did after winning the 1998 elections: rely on the army as the only institution implanted across the whole territory. One of Morales’ first objectives after winning the election was to neutralise the army, which was a hypothetical obstacle for his government. The Bolivian Army has always been classist, strongly influences by the National Security Doctrine that the US sponsored, which in synthesis considered the army as the guarantor of internal security, that is to say, controlled social mobilisations. Morales wanted to convert the army into his ally and, following the Venezuelan model, “guarantee the democratic revolution”. For this he took advantage of the “missile crisis” – the sending of Chinese missiles in the hands of the Bolivian army to the US during the term of the preceding executive – to put into retirement 28 generals, promoting people in intermediary posts such as colonels, opened the military academy to indigenous cadets (vetoed from entering until that moment) and thereby gained a greater fidelity on the part of the new military estate. The change in the army, carried out not without fears given that the oligarchy counts on important ties with the estate which have always being faithful to them, was visualised on May 1, 2006, when Evo Morales decreed the nationalisation of hydrocarbons and the army occupied the gas fields and refineries of the multinationals, provoking a undisguised malaise in the European Union, expressed to Morales via the European commissar on energy, Andris Piebalgs and the Austrian minister of the same branch, Martin Bartenstein (at the time Austria held the presidency of the EU). 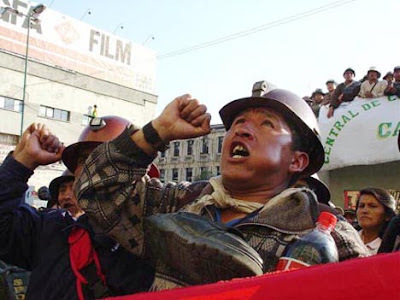 Half a year later the same operation was carried out with the nationalisation of minerals, symbolised in the take over by the state of the Vinto tin smelter plant in Oruro last February 9. Here again members of the army were used and Morales announced that it would be this institution which was to be put in charge of controlling 25 technological centres where future technicians in the field of minerals would be trained up. At the same time, Evo Morales gave the armed forces of Bolivia the mission of extending social development to all parts of the country in front of the incapacity of the state to guarantee its presence in all the territory and guarantee attention to the basic necessities of the population. That is why it is not uncommon to see a soldier carrying out tasks in eliminating parasites, vaccination programs, teaching literacy – in collaboration with the Ministry of Education and Culture – or building roadways. The army has also carried forward the “Free Surgery Campaign” in separated zones, covering aspects that the Cuban doctors, in charge of the preventive medicine, do not. And this in a moment in which Morales has decided to accelerate the campesino-military alliance by giving military status to the “red ponchos”, Aymara campesino soldiers with a long combative tradition in Bolivia, who he entrusted with defending territorial integrity “together with the armed forces” . The oligarchy has seen in this a real threat and considers them “illegal armed groups”, threatens a civil war and affirms that the popular vote of the departments who accepted the autonomy proposal has to be respected. Here we have an example of the manipulation of information, much liked by the defenders of liberty, and in the footsteps of Globovision in Venezuela: “the government [of Evo Morales] is promoting violence, the exclusion of minorities, racism, sectarianism, it deepens differences of ethnicity, social class, campesinos and city dwellers, rich and poor and is dangerously polarising the country into regions. It does not have the vision to accept that the “half moon” wants autonomy, that they won the vote. It wants to centralise, taking power and control of the state institutions, and lacks a program of government. The election of the judges to the Supreme Court by appointment, signifies the buying of justice” . This is the universal discourse of the oligarchy when it sees its privileges in danger, valid in any country in the world. The first year of Evo Morales has bright and dark spots, but it is necessary to support an experience that has rescued the sovereignty and dignity of Bolivia, at the same time as pushing forward a multicultural and participative democracy never before seen in this Andean country, even despite the rejection of the oligarchy and US. Maybe more and better things could have been done, but what has been done until now is nothing small. Bolivia Press nº 12, 3 de diciembre de 2006. CEDIB, 15 de enero de 2007. Declarations made by David Torrico, president of the Comité Cívico de Pando to La Razón el 4 de julio de 2006. La Razón, January 24, 2007. La Razón, January 25, 2007.